The morning of 3rd October 2015 began with a continuation of the extremely welcome, but very unseasonal sunshine of our current Indian Summer. 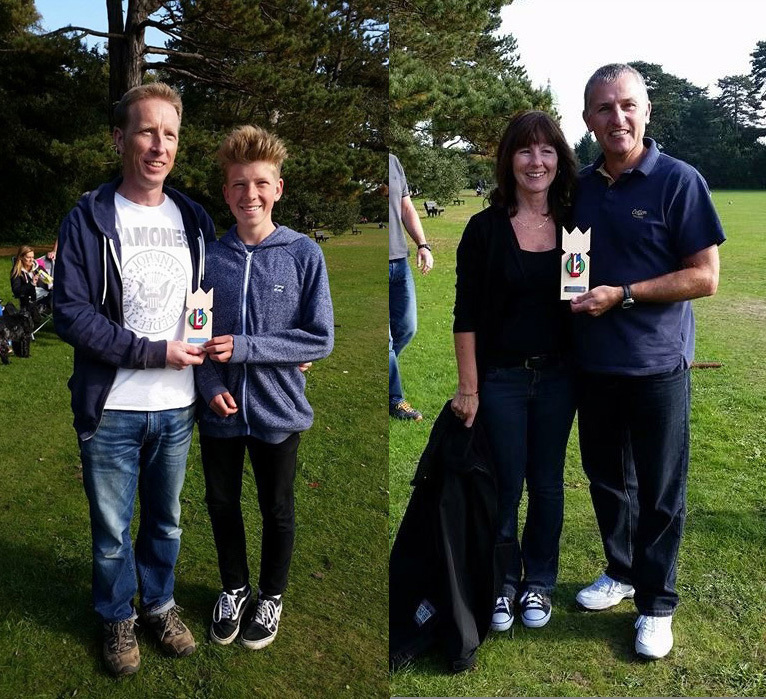 Huge relief for us as we gathered at Royal Victoria Country Park in South Hampshire for the inaugural Hampshire Open Championship. Twenty five players of all ages and experience formed into 10 teams and fought out a Swiss Ladder style competition. We had a "Cup" on offer for overall winner, and a "Plate" going to the leading team from the second rank. (Both were actually homemade trophies made of stripwood and balsa - 'Unique', I think would be fair!) The group played for around four hours in a competitive but very friendly atmosphere, punctuated by tea, cake and a few beers. It was a tightly fought affair at the top of the grid, with "Factor 5000" and "The Numb Chucks" keeping the pressure up right to the end. Finally emerging as Cup winners were the talented pairing of Glenn and Harvey - "The Gaz Watkins Allstars" (mystery surrounds who Gaz actually was, or is). Cup winners "The Gaz Watkins Allstars" and Plate winners "The Gems" with their magnificent trophies. Plate winners were Neil and Cheryl - "The Gems" in pretty much their first try at the game. An impressive start! A fun, friendly, sunny way to spend a Saturday. Thanks to all the teams for their support and spirit, and congratulations to trophy winners : "The Gaz Watkins Allstars" and "The Gems". More photos from this event can be viewed on the Gallery page here. Newer PostDate for 2016 Event Confirmed!